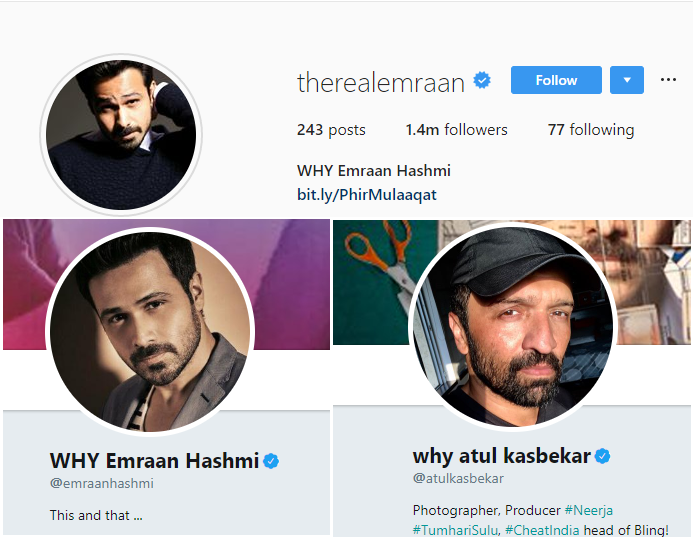 In a silent protest against the title change of Cheat India to Why Cheat India, Emraan Hashmi added WHY before his name on Instagram and Twitter. Following the Central Board of Film Certification’s (CBFC) objection, the title of Emraan Hashmi’s upcoming release Cheat India was changed to Why Cheat India on Thursday. In a silent protest over the same, the actor along with the producers and Soumik Sen, the director of the film changed their names on social media platforms. The Murder actor and producers Tanuj Garg and Atul Kasbekar added a WHY against their Instagram and Twitter names as a sign of dissent against the recent move by the censorship watchdog. The movie marks Emraan’s first venture as a film producer and is based on the Indian education system. It points out the use of unfair means at the time of examinations in the country. Scheduled to release less than a week from now, the film reportedly had to undergo major changes, from its name to the removal of the tagline – ‘Nakal Mein Hi Akal Hai’ in accordance to the directions by the censor board. The reason given by the CBFC to the filmmakers, reportedly, was that the previous title was ‘misleading in the context of the film’ and with almost no time left for the release, the makers decided to agree and change the title. Earlier last week, the makers of the movie had decided to pre-pone its release following Shiv Sena’s demand for a solo release for Nawazuddin Siddiqui’s Thackeray.